Jobs Act 3.0 Explained – What does this mean for business? 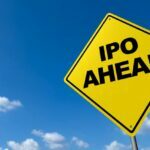 We discuss the key takeaways of the act and how it will impact future IPOs. Considering an IPO? We break down how your directors and officers policy will be affected. 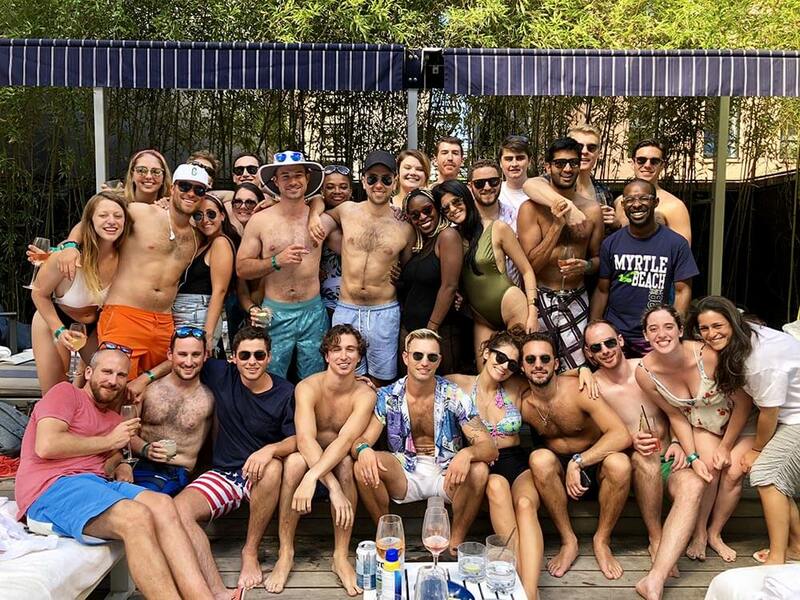 Our annual summer pool party at the Dream Hotel was on August 23rd. We had a blast! 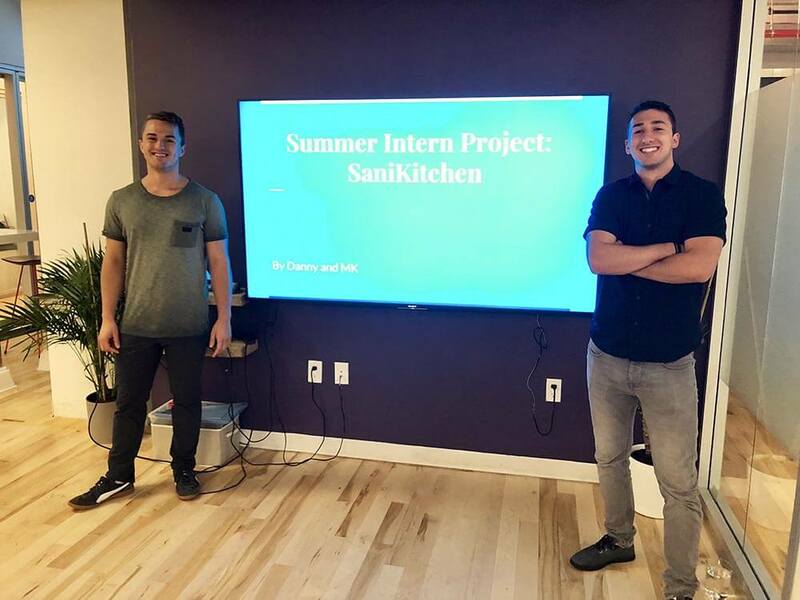 Our team grew (again!) with the addition of Mike and Libby! Mike has joined after 5+ years at a couple of venture-backed startups to strengthen our corp dev efforts. Libby is a newcomer to New York City and will be helping you with policy and certificate requests. Just getting back from another week at Burning Man…great running into some of you out in BRC! I hope your burn was fantastic. It was a rollercoaster as always, but this one really reinforced the principle of immediacy for me: staying in the moment to appreciate those around you, celebrate the high notes when they come and learn from the really hard moments. 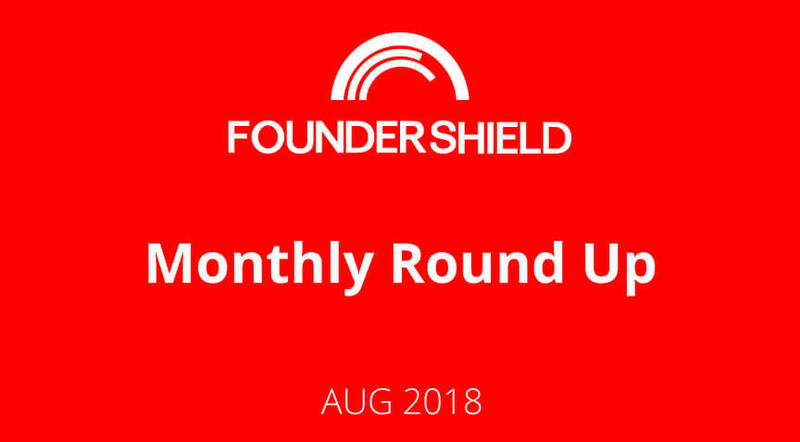 Looking forward to carrying that lesson through as we continue to build Founder Shield into 2019. Littlstar is the largest global platform dedicated to immersive virtual and augmented reality content. The platform allows consumers to discover, watch, and share content on all major virtual reality headsets, native mobile iOS and Android, Apple TV and Android TV, and the web. Littlstar’s proprietary technology distributes immersive content from global brands such as Disney, Sony, ABC, NBC, Fox, Universal, Showtime, A+E Networks, Syfy, Sony, Discovery VR, National Geographic, and more. In addition to the Littlstar brand apps, their developer platform and SDKs power over 150 apps for other companies with over 100 million downloads collectively. Littlstar is an official launch partner on Windows MR, PlayStation VR, Google Daydream, and has developed major content and technology partnerships with companies such as Sony and Alcatel. Littlstar is localized in many major media markets, including through its’ partnership with Sony Music Entertainment Japan. Jackpocket is the first mobile app in the United States that lets players order and manage official state lottery tickets from their smartphones. 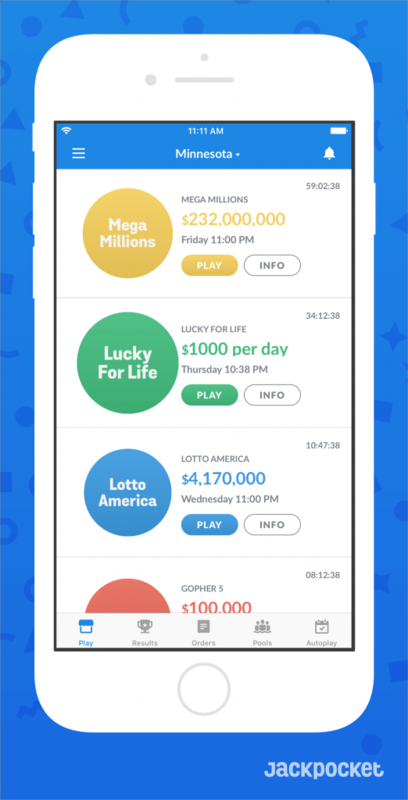 Jackpocket is creating a more convenient, fun, and responsible way to play the lottery by modernizing the $300B global lottery market with a mobile platform that everyone, including grandma, can feel good about. The platform combines an innovative ticket processing system with a sleek smartphone app, which frees lotteries from the limitations of the traditional retail model to make gameplay available anytime, anywhere. And by being the first to automatically lock a player’s identity to the ticket serial number, Jackpocket is making the lottery even more secure. Reply.ai is a customer experience automation platform. They work with customers like The Cosmopolitan Hotel, Samsung, and Coca-Cola, to provide an end-to-end platform to build chatbots and efficiently manage communication through major channels. Founded in 2016 by serial entrepreneurs and former Google and CERN engineers, they are the only startup ranked Top 10 Chatbots for Enterprise Customer Service by Forrester. How do you like them Apples? – Apple became the first US company to hit a trillion in market cap on Aug 2. Upon releasing its Q2 earnings, shares jumped 3.2%. Why? iPhone sales were almost identical vs last year but profits were up 17% thanks to the higher priced iPhone X. In addition, they boosted sales forecasts for the rest of the year. Amazon is just about in the $1t club too; their share price crossed $2,050 (the magic number) and currently tiptoeing back and forth. Whatsapp Advertising – Facebook has been sitting on its $19b acquisition of messaging app WhatsApp for 4 years now and is finally attempting to cash in. Execs announced that they plan to charge businesses for marketing and customer service messages in addition to “promotions”. With 1.5b users, that could mean a hefty chunk of change for Facebook. JPMorgan Pulls a Robinhood – JPMorgan is rolling out a free digital investing service called You Invest. JPMorgan has clearly targeted the app to millennials and new investors with up to 100 free trades per year, portfolio-building tools, and access to JPM’s equities research. UBER x Toyota – Toyota is investing $500 million in UBER to utilize its autonomous driving software in Sienna minivans. This latest round of funding values UBER at a staggering $72bn up from $48bn just 9 months ago. They claim to have pilot-scale deployments on the UBER platform by 2021. Tipsy Scoop – We had a very toasty end to August here in NYC, which naturally called for ice cream. But not just any ice-cream; we hit up Tipsy Scoop for some liquor-infused creamy goodness. The “Tequila Mexican Hot Chocolate” was a big hit. It’s Always Sunny is back – The often quoted-in-the-office series is back on for its 13th season and we’re pumped. FXX released the trailer last week, check it out. EPL fans, download this – The English Premier League season kicked off earlier this month and this app is a must-have for soccer nerds. Get live stats, goal updates, and video highlights for your team all wrapped up in a smooth interface. 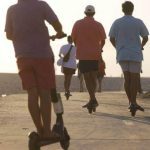 Chart of the Month – Quick update to our “Future of e-scooters” blog post. 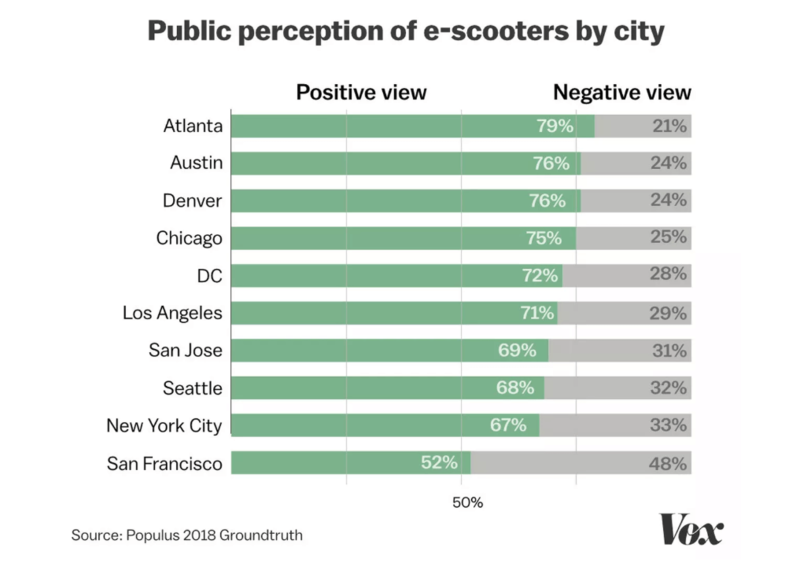 Here’s some new research by Populus on public perception of e-scooters by city. San Franciscans aren’t too happy.